"With Southwestern-Flavored Ground Beef, you can simultaneously make tonight's dinner and tomorrow's lunch. 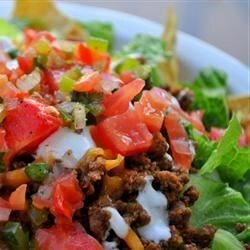 Just save out and refrigerate some of the taco meat and fixings such as shredded cheese and lettuce, plus chopped scallions and tomatoes. A good-looking salad like this will draw potential lunch traders. More likely than not, they'll be out of luck." Heat oil in a 12-inch skillet until shimmering. Add onion; saute until soft, about 5 minutes. Add garlic, chili powder, oregano and cumin; saute until fragrant, about 1 minute. Add beef or turkey and cook, stirring often, until it loses its raw color. Stir in tomatoes; simmer to blend flavors, about 5 minutes. Add salt and pepper, to taste. Stir in cornmeal; cook, stirring constantly, until it thickens, almost instantly. Cool and refrigerate (or serve warm for dinner as tacos or taco salad). Faster to make, healthier tacos! Put a portion of taco meat in a small container. Put some salsa in another small container. Put lettuce, tomatoes, bell peppers, scallions and shredded cheese in a plastic salad container or other lidded container. Pack tortilla chips in a baggie. Add a plastic fork and knife to the lunchbox. I may have used too much meat for spices. As a result, my husband was not fond of it. This was very tasty, and didn't take a lot of time or effort to make. Just top the tacos and you've got a meal (okay, more like 2 or 3 meals).